covered dock recommendations near St. Pete? Well...we are just now back from almost 3 weeks down at our family's place on Treasure Island just outside of St. Pete. We are toying with bringing our boat down there this next summer. I should have done it this summer but too late for that now. For various reasons, I'd greatly prefer to have our boat kept down there in a covered slip. I am looking for recommendations from others that may have more local knowledge than I currently do? Our #1 option right now appears to be Maximo Marina between St. Pete Beach and Gulfport....seems to be a relatively quiet facility and decent access to the gulf and ICW and only a few minutes from our place down there. Only other place I know of anywhere near that area that has some covered slips that would fit a 45' boat would be at the St. Pete Municipal Marina but they only have a few. Any other suggestions for marinas in the st. pete/treasure island/gulfport/madeira beach/indian rocks area that have covered slips in the 50' size range? Tony, Maximo is pretty good. We had Moonstruck there for a couple of months in '06 or '07. Very quiet and sheltered. Long channel in off Boca Ciega Bay. Just don't get run over with the big fork lift crossing the street. I think that would be the closest covered slips to T. I. Maybe Healhustler will come up when he learns there was a Bob Evans Restaurant near. I guess that's why this Tennessee boy liked the place. You should feel right at home. You might try Loggerhead marina in So St. Pete, about 10 minutes from Maximo. They have about 20 covered slips. We are leaving ours the end of the month. The facilities I believe are nicer than Maximo. Cost I think is $11/ft. The location IMHO is the best in the Bay area. I wasn't aware that Loggerhead has covered slips. It is a great location for getting out and cruising. The city marina has some covered slips, but they are in town. I have to agree that Loggerhead is much nicer than Maximo. Plus they have the deal of being able to stay at their other marinas. That's also a good price for a covered slip. but you can't walk over to West Marine and Bob Evans Restaurant. They are building condo's around the area so there will be a lot of construction for the next year or two. This is partly why we are re-locating. 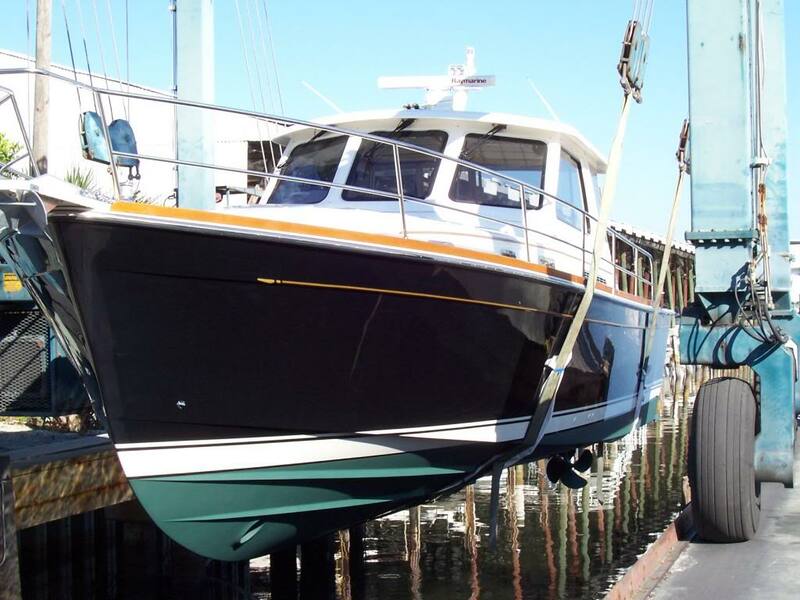 Tony, here is Moonstruck going back into the water at Maximo after a bottom job. They did good work for me. We stayed at the St Pete Loggerhead in a covered slip back in 2011 for a little while, good marina and the access road goes all the way round so that you can drive right to your slip. Good facility nice pool, laundry etc and super protected from weather. Only issues if my memory serves me right is that the entrance into the marina and bridge can make it a little tight for a 45' boat. I think I like Maximo's location better- closer to our place down there and closer to Eggmont, etc. I am going to look into some uncovered slips as well but being used to boating on the TN River and lake lanier, I have grown to really appreciate a nice covered slip to keep the boat in! Yeah, and you will appreciate fewer spiders, too.